The General Knowledge: What is a Goblin? 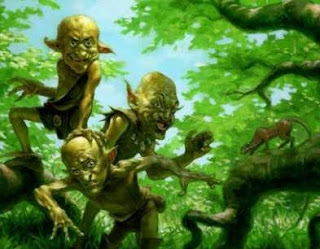 The term Goblin simply refers to the uglier members of the mythical fairy race. Fairies are small supernatural creatures of human form. According to some traditions, goblin comes from Gob or Ghob, the king of the gnomes, whose inferiors were called Ghob-lings. They are small, beautiful, airy, and nearly transparent in body and can devour in any shape. They are known to play pranks (a trick of an amusing, playful, or sometimes malicious nature) and it is best to treat them with respect. Goblins are particularly unkind to humans, break things, causing mischief and other such activities. It is said that Goblins are the most active at Halloween. **Fact: In Germany, if you met a man with green teeth he was a nix, or a water spirit. When nixes ventured on land, some part of their clothing was always wet. Sometimes, Goblins were human-sized fairies, and they were hard to tell from mortals. What is UNLUCKY 13 all about? What does Venus look like?